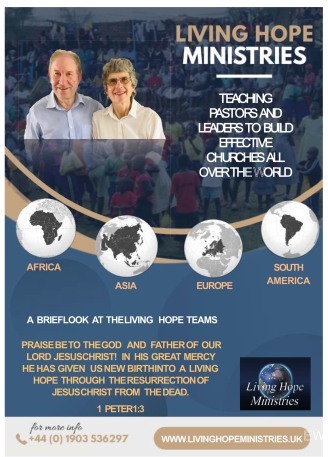 Living Hope Ministries Gift Day 24 Feb.
We are very grateful to the Lord to be able to write to you at the beginning of another year and pray you will know God’s blessing throughout 2019. This is a very special year for us in the family of Living Hope as, by God’s grace, we celebrate 25 years since the first trip to Kenya in 1994. You will find on our website, information which shows how much Living Hope has grown and how many people and countries we now work with. The task has not changed. The need to equip and encourage pastors and leaders to faithfully teach God’s word, is still very important. The need to preach a clear Gospel, which honours Jesus as the only true Saviour, Lord and God, is as vital today as ever. We value your prayers and support, so our Annual Gift Day is on Sunday February 24. We would be pleased if the churches and prayer partners who are linked with us, would set aside a few minutes to pray for Living Hope on that day. To download this video, RIGHT CLICK here.